The number of killings in 2017 -- 72 -- represented a drop of 12 percent from the city's five-year average. 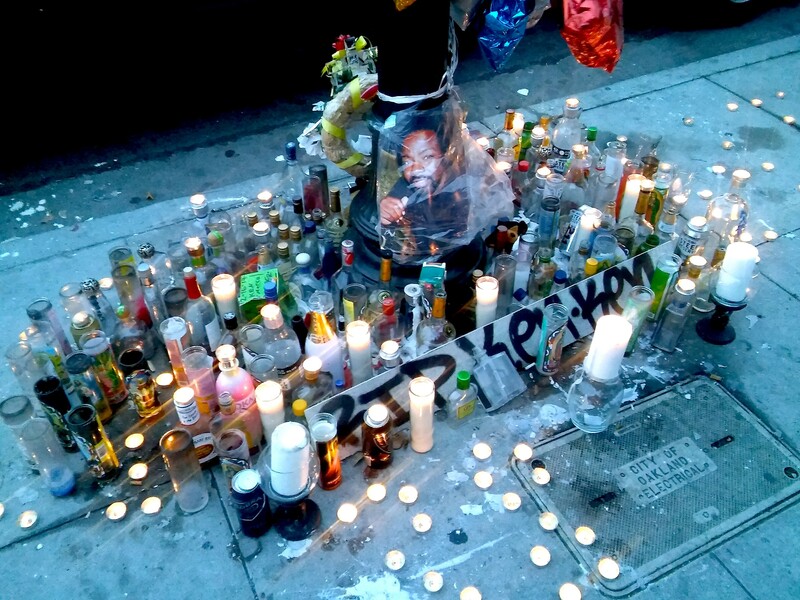 A memorial to Kenneth Smith, one of Oakland's 72 homicide victims in 2017. Last year, there were 72 homicides in Oakland — the second lowest number since 1985, when standardized record keeping began. In addition, shootings and other violent crime also trended down in 2017, part of a five-year drop in violence. Today, Oakland city officials said these new numbers reveal that the city's Ceasefire program is working to prevent gun violence. At the same time, police said that OPD's ability to solve homicides has dramatically improved so that most cases are now cleared to the district attorney for prosecution. "There are people behind these numbers," said Reygan Cunningham, director of Operation Ceasefire, which coordinates the police response to gun violence with social services and interventions. While she said the current level of violence is still unacceptable, at the same time, the city's efforts have prevented roughly 329 shootings from happening over five years. Oakland Police Capt. Ersie Joyner, who runs Ceasefire for the department, called the city's approach to gun violence an "enormous paradigm shift." And in an unusual statement for a police captain, Joyner thanked the very individuals who are most likely to pick up a gun in order to survive or seek reprisal on the streets of Oakland. Rather than resorting to violence, said Joyner, many of these individuals chose to accept alternative paths offered through the Ceasefire program and its social service partners. Oakland Police Capt. Roland Holmgren, who oversees OPD's homicide investigations, said that the department's clearance rate for homicide cases is now 71 percent. The department's five-year average, according to its most recent annual report, is 53.6 percent, meaning that last year, suspects were identified in a substantial number of murder cases for prosecution. In past years, Oakland failed to solve many violent crimes due to a shortage of staff and an over-emphasis on patrol policing rather than investigations. Many witnesses to murders have also traditionally been distrustful of police and unwilling to share information. As a result, OPD's homicide clearance rate in past years was dismal. As Ali Winston reported for the Express in 2012, the homicide case clearance rate was only 29 percent that year. It hovered around 30 percent for years, while about 90 to 100 people were annually being killed in the city. Although Oakland Mayor Libby Schaaf organized the press conference today about the crime reduction numbers, she didn't take full credit. Instead, she said that "no mayor can take credit" and that Oakland's approach was kickstarted by grassroots activists like Oakland Community Organizations, which lobbied for Ceasefire's creation in 2012. In 2016, the city hired a team of Northeastern University and Yale University researchers in 2016 to conduct a scientific study of Ceasefire. Their report is due out in June and should reveal whether Oakland's approach is actually the cause of the reduction in gun violence in the city.